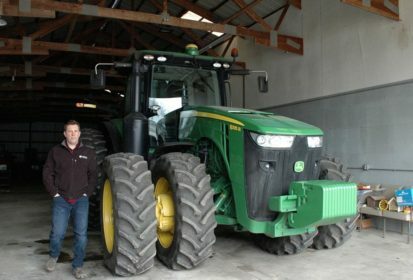 Kane County, Ill. | Reuters — Lucas Strom, who runs a century-old family farm in rural Illinois, canceled an order to buy a new US$71,000 grain bin last month — after the seller raised the price five per cent in a day. A+P Grain Systems in Maple Park, Illinois — the seller of the storage bin Strom wanted to buy with a neighboring farmer — raised its price two days after Trump announced aluminum and steel tariffs on March 1 to protect U.S. producers of the metals. Strom and his neighbour backed out. The metals tariffs also hitting makers and sellers of farm equipment, from smaller firms like A+P Grain to global giants such as Deere and Caterpillar. Such firms are struggling with whether and how to pass along their higher raw materials costs to farmers who are already reeling from low commodity prices amid a global grains glut. Trump imposed tariffs of 25 per cent on steel and 10 per cent on aluminum in a move mainly aimed at curbing imports from China. He has since temporarily excluded the European Union and six other allies from the duties and given them until May 1 to negotiate permanent exemptions. A+P Grain president Dave Altepeter said the steel used in their bins is made in the U.S., but domestic steel prices also have soared because of the tariffs. The price of steel used in A+P’s grain bins has jumped about 20 per cent since January 1. Last year, about 95,000 tons of steel were shipped to the agriculture industry, compared to the 14 million tons for the U.S. auto industry, according to the American Iron and Steel Institute, an industry group. In Riverton, Illinois, farmer Allen Entwistle said he postponed construction of a new $800,000 storage system for grain after Agco’s GSI unit increased prices by 15 per cent. Other companies, including Deere and Caterpillar, are also facing pain from rising steel prices, which account for about 10 per cent of equipment manufacturers’ direct costs. U.S. net farm income is forecast to drop to $59.5 billion in 2018 dollars, down from $64.9 billion in 2017, an 8.3 per cent decline, according to USDA (all figures US$). In Sheffield, Iowa, Sukup Manufacturing has seen steel prices soar 40 per cent since November, said Brent Hansen, the company’s commercial accounts manager. Prices have jumped by 25 per cent for thermal insulated panels that keep food cold — which can use either steel, aluminum or both, said Glenn Todd, owner of Todd Construction Services. The company has built food processing and storage facilities for Bumble Bee Seafoods and poultry company Foster Farms. — Reporting for Reuters by Tom Polansek in Chicago and P.J. Huffstutter in Kane County; additional reporting by Rajesh Kumar Singh in Chicago.